I read these types of posts constantly. The most clear-headed thinker I’ve found on this topic is Cal Newport, a computer science professor at Georgetown and author of So Good They Can’t Ignore You and Deep Work. I’ve shared the link to his TED talk about quitting social media in the past. I heard sometime last year that his next book would deal with the idea of “digital minimalism” and was immediately intrigued. Well, it was well worth the wait. 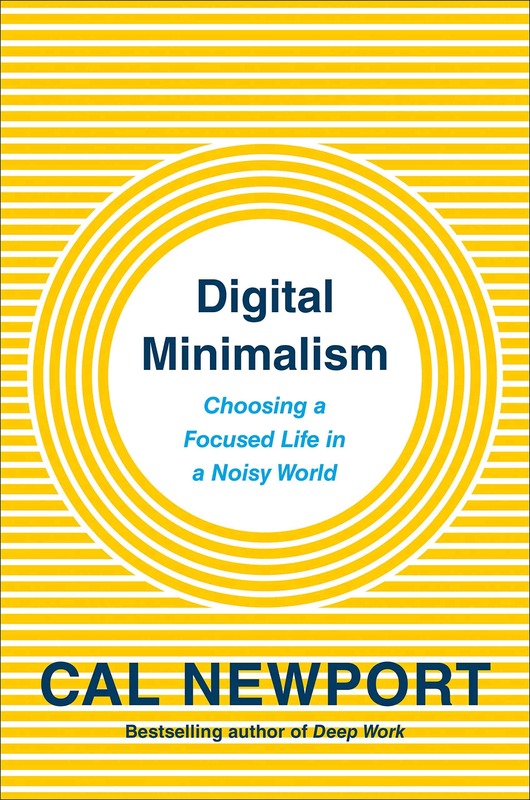 Cal Newport’s Digital Minimalism: Choosing a Focused Life in A Noisy World is a persuasive call to reconsider the choices we make about our digital lives. Newport challenges the reader not to throw away all technology–he’s no Luddite seeking a purely analog life–but rather to ask very pointed and thoughtful questions about why and how we use technology. He challenges the notion that a mere potential benefit of a device or service is a good enough reason to adopt its use, or that having more features is automatically better. He draws the reader’s attention to the fact that we are the product being sold by social media corporations, and that our time and attention have been monetized for someone else’s benefit. Newport suggests a 30-day challenge: an intentional digital fast (with common-sense provisions for certain necessary work/life demands), followed by a slow and deliberate re-integration of tech. During this post-fast period, he suggests that we ask 3 questions of our devices and apps: Does using this tool support a belief or priority that I deeply value? Is this the best way I can pursue that ideal or value? Can I optimize the way I use this device or program in pursuit of that value? For example, if we use social media for keeping up with our family, Newport would argue that what we’re doing when we like or share or comment is mere connection, and it doesn’t take the place of real communication. Instead, while we might still use social media in a very limited way (both in time and scope) to catch up on news about our loose circle of acquaintances, we should also pursue actual communication with people who matter to us via in-person visits, phone calls, or even video chats (for far-flung loved ones). The complexity of face-to-face and voice-to-voice communication, Newport writes, is what provides the richness of human interaction–a complexity that text-based communication falls short of providing. Throughout the second half of the book, Newport gives recommendations of practices one can pursue as part of the “Attention Resistance” pushing back against screen consumption. Some of these ideas are pretty simple (make time for solitude, go for walks, pursue an analog leisure activity that requires physical exertion), while others are a bit more challenging, at least for me. One such challenge Newport makes is to stop clicking “like.” He talks about how social media introduced the “like” button as a way of providing a minimal amount of feedback that still stimulates the user (the “digital slot-machine” idea of irregular positive feedback conditioning). I struggle with this, because I use the “like” button a LOT (as those of you on my socials can attest). However, I see what he means. A real-world example: I just posted on Facebook 42 minutes ago that we were having another baby. As of right now, 3 people have actually commented (2 of which said “congrats!”), and 20 people have hit the “Like/Love/Wow” emoji. [Update: I’ve gotten more comments since then, but the ratio of reactions to comments is running about 4-5 to 1.] Now, I do appreciate that these folks reacted to the news (that’s how Facebook describes it–reacting), but the vast majority so far have only reacted enough to click a mouse or tap a screen and then likely moved on with their scrolling. And I can’t fault them; that’s just what we do, isn’t it? But Newport suggests we stop, because this isn’t actually communicating anything. It’s one bit of information, a blip on the radar. And it’s a far cry from actual human community. The only critique I have of Digital Minimalism is a worldview issue. Newport is writing from a secular perspective, so when he talks about the evolution of man as a social animal, he is missing a glaring clue as to why we are social creatures. Mankind was created by a personal, social, communicating God, a God who speaks and interacts with His creation, and because we bear the imprint of His image, we are social and communicative beings. That’s part of the reason why this reduction in human interaction is so unnatural; we were made by God for community, but our community is being undercut by a digital counterfeit that steals time away from incarnated interaction. The spiritual element of this whole idea is missing from Newport’s thinking on this subject, which is why other books by authors like Tony Reinke and Andy Crouch are necessary and helpful supplements to the ideas Newport presents. Cal Newport’s Digital Minimalism does more than simply point out the problem of digital addiction and social media enslavement. Newport helps the reader consider how to use these tools in a way that is healthier and more intentional than simple consumption and constant attention. While I think there are some blind spots in his argumentation due to differences in worldview, I would happily recommend this book to anyone who struggles with the idea of giving up digital tech or social media but still wants to reconsider the way he or she approaches these tools. My wife made this picture for me when we were dating. (One of her many gorgeous papercraft creations.) It’s based on the analogy of the rocks, gravel, and jar. In short: a teacher challenged his students to put several sizes of rocks, along with sand and water, in a jar, but they could only do it by putting the big rocks in first. The lesson is this: if we don’t prioritize the things that matter most, they will get crowded out by the lesser things that take up all the space. Early on in our relationship, H. knew that one of my greatest challenges in our marriage would be trying to manage the big rocks, so she made me this as a reminder. Lately, I’ve been focused on three big rocks in particular. My Household: Thing have been going well at home. My wife and I will be married 5 years this summer, and married life is a blessing. We’re looking forward to a family beach vacation in a few months and making plans for the near future. The kiddo is now a year and a half old, and just brilliant; her mind is a sponge, and she’s got a goofy and playful personality. Baby girl #2 is set to arrive this summer, and we couldn’t be more excited. We have been duly warned that going from 1 to 2 kids is a game-changer, but nevertheless we’re eager to meet this little sweetheart. My Church: Being an elder at my church is already rewarding and stressful. There are new and more challenging questions I’m asked to consider, more conversations to be had, more responsibilities to shoulder–but I love it, y’all. The biggest challenge for me currently is working through the vast amount of material and training for child safety and abuse prevention materials. As I’ve noted before, this is becoming a big ministry focus for me lately, as I work to make sure all of our policies and procedures are consistent and up-to-date. I’ve been filling up a legal pad with ideas and questions, and what I really need is a day or so to sit and synthesize all the information I’m learning. (Anybody got a spare day laying around that they could loan me? Because I’m time-poor at the moment.) Unfortunately, this isn’t an issue that can or should be put on the back-burner. The time to address these issues is now, and I want to make sure I’m moving forward with the intentionality the issue deserves. My In-Person Relationships: One of the ideas kicking around in my head as a result of reading Cal Newport’s latest book (review forthcoming) is that in-person communication and relationship-building is more powerful and more meaningful that digital, mediated communication. What this means is that being in the same physical space as the people you care about and want to connect with is worth the time and effort to do so. Sometimes that looks like driving across town through the evening rush to visit a family member in the hospital, or meeting a long-time friend for breakfast whom you haven’t seen in a few months. Maintaining these connections takes effort and grates against the easy-everywhere connection of likes and comments. But I’m finding that it’s worth it. That said, there are a few big rocks that I’ve neglected lately, like exercise and writing and prayer, that I need to work back into my life. The fun distractions like social media and movies are sand and water in my jar. They work fine as fillers, but if I don’t get ALL these big rocks in place first, they’re just not going to fit. I’m chewing on some ideas about how to do this better. I’ll share those when I come to conclusions worth reading. So there’s the update. Hopefully, you’ll see me back here sooner than 2 weeks from now, which appears to be my average time between posts lately. I bet we can do better than that, though, right? Let’s try. Your Turn: What are the “big rocks” in your life right now–the most important things you actively make time to pursue? Feel free to share below. See you next time! My current status: feeling like hot garbage, thanks very much. But God is good, so we press on, yes? That said, I would appreciate your prayers for a quick recovery. Thanks. Now, onto the hail of bullets! I read this Bloomberg article the other day and immediately went on a Twitter rant (now deleted). The idea here is that allowing the government to hold more of your money for a year before giving it back to you at no interest is a “good” thing–at least that’s the spin. And that’s exactly what it is: spin. Like him or hate him, you have to acknowledge that the current administration lowered taxes (and NOT just for the rich, no matter what the hype-train tries to tell you), which means less is withheld from people’s checks because they are paying less in taxes. This isn’t a bad thing, no matter what some presidential hopeful says about it. But the Bloomberg piece contains a pretty insulting assumption: many Americans, particularly lower-income Americans, must rely on Daddy Government to hold their piggy bank because they can’t control themselves enough to save on their own. Talk about the bigotry of lowered expectations. Still reading short stories, still making notes. One of these days I’m going to bust out with a bunch of #52Stories posts, just you wait. Latest musical find: This one-hour symphonic medley of music from the smash-hit indie computer game Undertale. While the chip-tune version of the soundtrack got on my nerves just a bit, I *love* this. If you’re a Christian, I would ask you to pray for churches in the Southern Baptist denomination. Lots going on this month. Lots to think through and do. Pray for wisdom, grace, fidelity to God’s Word, and the courage to act with integrity and honor. I’m trying to take in as much information as I can, so that I can serve our church by making sure we have policies and processes in place to protect our kids. That’s all I have this week, gang. Thanks for reading and thanks for your patience. I know many of you are subscribed because you like certain types of content, and these kinds of TIWIARN posts aren’t that. Nevertheless, I appreciate that you read, and I hope you continue to do so. Have a great week.